1 Welcome to Learning Albanian. Q is the most far-out non-western compliance letter in the Albanian language. It is pronounced a sharp 's' like in chuck. Both of these could be derived from the word sq. 'shqiponja' == en. "the eagle" or is it the other way around that shqip is so awesome that the name of the eagle then gotta be shqiponja. As you may notice the Albanian nouns have their article affixed to the end of the noun and not preceding it. Later-on code like this 'Shqipëri, -a' tells you that the definite form is formed by adding the definite article '-a' to it. Albanian has 2 grammatical genders: masculine and feminine but worry not, sing. indef. nouns that end in a consonant are masculines and nouns ending in a vowel are feminines. Exceptions are if the noun clearly is of the other gender than the vowel/consonant rule would say. Albanian verbs have no infinite forms so all the dictionaries have them listed by the 1st person singular. This is handy for quickly learning to express what I do or what I would like to do. For those of you who know French you'll feel at home as adjectives and adverbs are placed after the noun also in Albanian. Nouns and adjectives are connected by an adjectival article. For nominative these are 'i' for masculine and 'e' for feminine. "kam" == "to have" are highly irregular, but the present indicative and imperfect indicative, present subjunctive and imperative forms of them are highly similar as you can see from the charts below. Ë is not pronounced when it is at the end of a word. When inside a word it is like the syllable "uh". Knowing the first things to know about nouns and adjectives now would be a good time to consider starting to play the Basic Albanian 1 on Memrise. Memrise programs your brain slightly differently than traditional methods, but hey, how harmful can it be? Albanian has a lot of loan words but they come from a wide variety of languages including but not limited to Latin, English, Italian, French, Slavic, Germanic, Arabic, Swedish etc. Jamaican shares from Albanian the word 'I ri'. In Albanian 'i ri' means both new and young for masculine nouns. Corresponding form for feminine nouns is 'e re'. Online Etymology Dictionary is useful if in doubt whether a word comes from English or if it a loan word of theirs. On Saturday 2018-11-17 I made a copy of this list of loan words for English speakers to Wikibooks:Albanian/Loan_words_for_English_speakers and in the future when I add words I will update both this article and the one at Wikibooks. In the long term the best solution would be to put the words into a database, such as Wikidata and to generate the lists automatically from the database. This way there would not be the problem that some words that could be classified under "English" are instead in French or Italian because the pronunciation matches better those langauges. qiell, -lli, -j == le ciel == the sky. natë, -e, net == en natt == a night. Colloquial Albanian (2012) is an excellent book for anglophones by Linda Mëniku and Héctor Campos. It is concise and well organized. The learning curve gets steeper towards the end. Routledge, the publisher has kindly made audio for all text passages downloadable for free from the book's homepage. As of 2018 the vocabulary of this excellent book have not yet been made to a memrise. A previous edition in the same Colloquial series from the early 90's does have a memrise of the vocabulary. Discovering Albanian 1 (2011) is also by Linda Mëniku and Héctor Campos and it consists of a textbook and workbook. 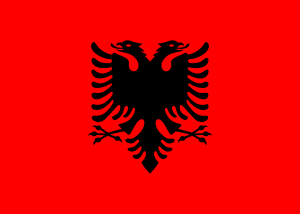 As of 2018 there is no Discovering Albanian 2. The audio for the textbook can be accessed only via 2 CD's. Who has CD-players these days? Let's hope The University of Wisconsin Press wakes up and provides streaming and download at no extra charge. There are various streaming apps available in the app stores. Live Online Radio is a radio streaming service for the web. It has one of the largest selections of Albanian radios. Radio.garden has a beautiful user interface where you tune into radios by spinning a globe to the desired location of transmission. https://albanian.tv/ offers streaming of many of the popular Albanian TV channels. It often works, but occasionally the streams have trouble playing out without intermittent interruptions. The RTSH Tani app is available for Android and iOS Apple phones. With the app you can access all the channels broadcast by RTSH including RTSH Film. The app does not have ads (excellent) whereas the RTSH channels do have ads. RTSH Tani app also features a VOD archive where you can watch recent programs up-to-2-days into the broadcasting history and a handy integrated EPG. These you can find on Youtube by searching for 'filma me titra shqip'. Watching movies spoken in a language you understand while reading the subtitles in the language you want to learn is an excellent way to learn and refresh in a low-effort manner. There are also Albanian films. These are unfortunately not subtitled and the speech is often really rapid. French do subtitle some of their own films on TV5MONDE to aid the non-natives tackle the 5 words per second pace. Wikibooks.org, Albanian version may be useful after you have gained the basics. Reading wikibooks of subjects and fields you already know may fast-forward your ability to read some text. Albanian Wikipedia Same advice, select subjects this way you have a clear idea of what it is likely to say. Wikipedia writing is less predictable than a textbook. Foreign Services Institute (FSI) (1965) .pdf book on Albanian. From this I can recommend the history introduction of this text aimed mostly for US armed forces personel though naturally the FSI's work helps also non-military government workers to gain knowledge too. Albanian language has changed so much since 1965 that this cannot really be used to learn contemporary albanian but the intro is good if you are a history and culture puff. Some flashcard software may be useful for learning specialized vocabulary. See the Wikipedia list of flashcard software for options. https://memrise.com is a spaced repetition flashcard and beyond language learning game and it has various memrises of varying quality. Memrise programs your brain slightly differently than traditional methods of vocabulary acquisition. Basic Albanian 2 (~210 things to learn) are of high quality, simple intros to the basic building blocks made by BaaS, an apparent memrise genius if you look at his productivity, scope and quality of his work. (No typing) Albanian Menu (~110 things to learn). " For people intending to travel to Albania this memrise obviously highly recommendable as we all gotta eat. "No typing"-courses are fun because they are faster to play so you also get points faster. Discovering Albanian 1 (~1800 things to learn) a professional quality memrise based on the vocabulary lists of the book of the same name. This memrise contains audio in high quality, consistency and precision for practically all words and phrases to be learned. This memrise has over 1800 things to learn so it is the biggest available. The makers of this memrise have used sensible notation: For nouns indefinite and definite singular and indefinite plural are given etc. etc. Albanian Verbs (~480 things to learn). Teaches you the 1st person singular form of verbs (Albanian has no infinitives) with the exception of "to be" and "to have" where all present tense forms are taught in the last level. This page was last edited on 17 February 2019, at 15:24.